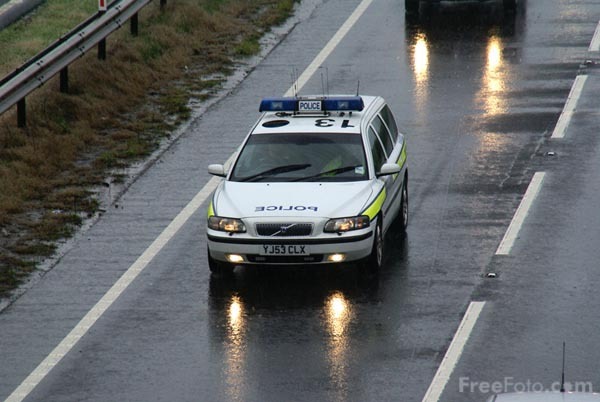 Photograph of a Police traffic car in heavy rain on the A1 near Leeming Bar, North Yorkshire. Friday 15 June 2007 was the wettest day in North Yorkshire for over 30 years. Road travel was difficult, with many roads becoming impassable, as flash floods affected the whole county. A stretch of the A1 near Leeming Bar was flooded when 5.1cm of rain fell in just four hours. VIEW: More images from the category Traffic congestion caused by heavy rain or taken at the same location or around the same time .